What does the world look like when you map it using data about people? See the world anew — a connected, ever-changing and fascinating place in which we all belong. You’ll never look at a map the same way again. Using beautiful and unfamiliar world maps created by Benjamin Hennig (and shown in colour for the first time here) Danny Dorling shows us that in many ways life is slowly getting better and there’s much to be optimistic about, as long as we continue to connect with each other.We need new ways of viewing the world, its future, and how we can be a little less afraid if we do not see other people as being our enemy as much as we currently do. We currently fear people from other countries too much, we fear that those in faraway places are taking ‘our jobs’, we fear what we do not know. But if we begin to see the world as a whole, as the place from which we all get our food, as the place that we all pollute, then as our global population begins to stabilise we can learn to become less fearful. Some people learn faster than others. The British Prime Minister, Teresa May, recently said that ‘if you believe you are a citizen of the world, you are a citizen of nowhere’. It is not her fault that she was taught geography at a time before we could map all the citizens of the world and see that we are each just such a citizen. We are now all incredibly closely connected, through trade, through migration, through ideas and through hope. Seeing the earth shaped in proportion to the amount of rain that falls, and how that changes over a year, shows the planet as a single entity that almost appears to have an annual heartbeat. Seeing all the humans of the world drawn on a single projection can help us realise that imagining all of humanity as one is not beyond the scope of our collective imaginations. 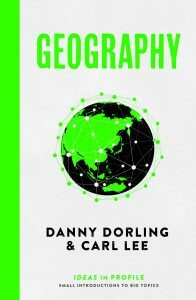 The 2016 book behind the talk was written by Carl Lee and Danny Dorling. It is titled “Geography: Ideas in Profile” and is available here, where you can also find copies of the maps shown in the talk. Further resources are available on the TED website. And high resolution copies of the maps can be found here and here.